vejle-danemark Solving Local Challenges “The geographical location of the city of Vejle implies that the city is prone to flooding from rivers, especially from the sea, during heavy rain and cloudbursts. 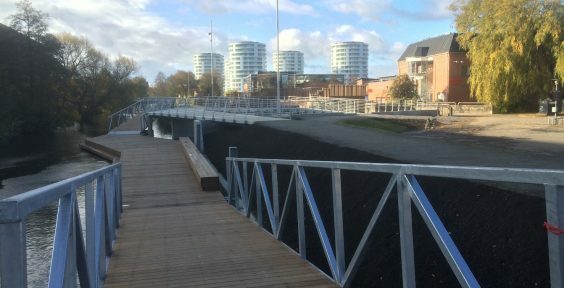 This situation forces us to experiment with many different kinds of adaptation solutions”, says Ulla Pia Geertsen, climate coordinator and project developer in Vejle Municipality. “As the city grows, transportation needs increase and this currently means that cars take up the space of the city in the same way as water does. We need to enhance the flows of the city and the choices for green mobility”, says Boris Schønfeldt, mobility coordinator and project developer in Vejle Municipality. Project and IoT Experience Since April 2016 Vejle has been a partner in the Low Carbon City Lab’s (LoCal) Carbon Track and Trace project. Through this project it has gained experience with sensor data and internet of things (IoT) networks, concepts the city is eager to explore even further. “IoT and smart city solutions are very interesting for us as means to creating a greener and more livable city”, says Jette Vindum, smart city coordinator and project developer in Vejle Municipality. Adhering to Tradition and Breaking New Ground The citizens of Vejle have traditionally been active in co-creative partnerships with the municipality. This will continue to be an important focus in the activities that Vejle wishes to carry out within the Climate-KIC community. Vejle was the first European city to launch a Resilience Strategy in 2016, and the Climate-KIC partnership fits very well into the goals of this strategy. Securing green mobility in the future, making the city resilient to flooding incidents and using new data and IoT will be the main points of focus for Vejle’s future activities within Climate-KIC. The city also wants to investigate sustainable business models and alternative ways of financing climate adaptation and mitigation activities. The topic is already being touched upon in the city’s current pathfinder project. About Vejle Vejle is a small municipality with only 112,000 citizens; still it is the 9th largest city in Denmark. Thus, Vejle faces many of the same challenges as large cities do but is able to test and deal with them more rapidly than large cities are. The distance between citizen and politicians is short and therefore project developers can act fast in order to adjust to the actual needs of the city.